Motorboats have been an object of fantasy right from my childhood – I love motorboats as much as I am afraid of rowboats. The first picture that comes to my mind when someone says “Boat” – would be a journey to my mother’s hometown. 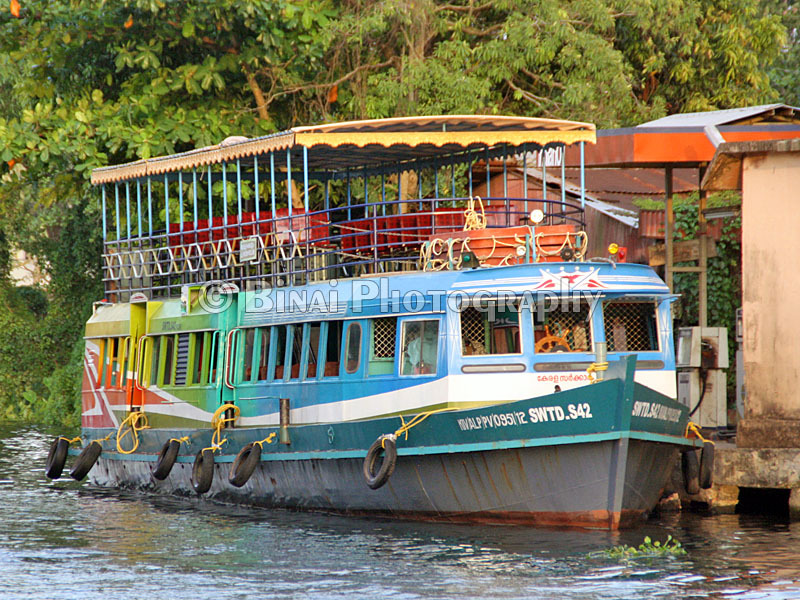 That was a journey is a diesel powered motorboat riding along the Pamba river. The boat used to vibrate so badly that one would start itching their nose within minutes of commencing the journey. The seats used to have “coir cushions” covered in green rexine. I did my longest journey by boat sometime in May 2005 – that was a two hour journey from my mother’s place (Nedumudy) to Alappuzha. I vaguely remember the fare to be Rs. 8 at that time (the bus would take only 30 minutes and charge only Rs. 7)!! Fast forward to 2012: I and Jayasankar once discussed about a plan to travel from Kollam to Alappuzha by boat! One fine weekend, Jayasankar calls me up, and asks if I was free that weekend for a ride from Kollam to Alappuzha – that was surely set to be an opportunity of the lifetime. My reply was positive, no doubt. Then began the fine-tuning process – including booking tickets to reach Kollam, confirming that the boat would operate on the day, and then scouring over the internet to find which route the boat would take. 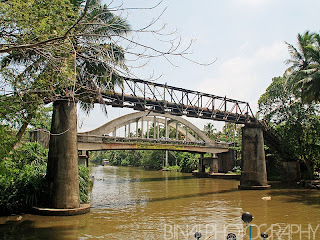 Getting a ticket to Kollam, from Ernakulam was proving a bit difficult – my favorite train (Guruvayur-Trivandrum Intercity express) was already running a long waiting list for AC Chair Car. Reluctantly, I booked on the Vanchinad express. May 06, 2012: After leaving my car at the parking, I slowly walked to the railway station building – the departure of my train was still 25 minutes away. I first went to the sole tea shop on the main platform – the vendor arrogantly refused to serve me tea if I did not have change. I decided not have tea – and bought two newspapers instead! The Vanchinad express always departs from Platform 4. Platform 1 was occupied by the Ajmer-Ernakulam Marusagar express which had arrived a while back – the EMD loco that brought in the train was heard whining off to glory somewhere in the yard. The AC Coach of Vanchinad express is in the rear half of the train. As usual, it was a very old AC Chair Car coach. 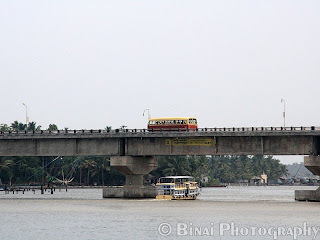 Vanchinad usually has very poor loads from Ernakulam – might be due to the awfully early departure (5 AM is not really too early) or due to its longer running time. I got into the half-empty coach and occupied my seat – that was thankfully an aisle seat in a two-seater. I got my cup of coffee from a vendor who came in to the coach, and even got some light snacks to pacify my empty stomach. The train got moving on time – I just showed the SMS that I received from IRCTC. The TTE accepted it as a valid ticket – and just verified my ID proof. The journey to Kollam was uneventful. I slept for a while in the train, and did a bit of door-plating. The train was on time at Kollam – interestingly, Jayasankar and Sreeram too entered the station just as my train left Kollam. All of us headed to the Veg Refreshment room for breakfast, and then headed to the Boat Jetty. We pushed ourselves into a puny Bajaj Autorickshaw – which cried out aloud as it struggled to pull its load up a flyover. 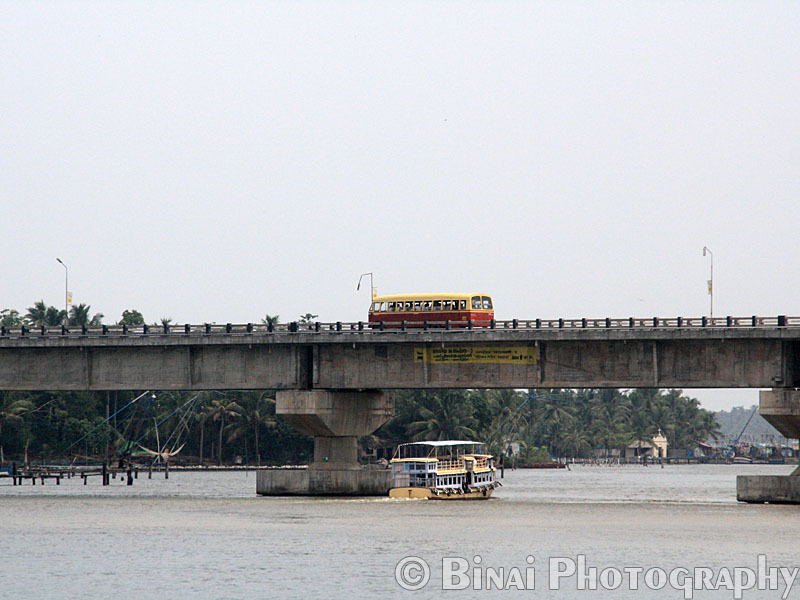 The ride from the railway station to the KSRTC bus station (the boat jetty is right outside the KSRTC bus station) took about 5 minutes. The first thing we did was to head to the SWTD office and get our tickets – at Rs. 250 per head; the ticket promised us an interesting 8-hour ride through the backwaters of Kerala. The boat was already berthed at the jetty – the boat did not look impressive at all. We kept teasing ourselves calling it a luxury boat! We still had over an hour-and-a-half to go – I was busy clicking buses, while Jay and Sriram went about getting some snacks and cold drinks to take us through the day. The boat jetty was fairly active as well – there were arrivals and departure throughout the period. SWTD operates a handful of services from here, and most of them are to surrounding areas. Around 1005, we decided to head to the boat – the departure was still 25 minutes away. But the other two, wanted to get “good” seats. 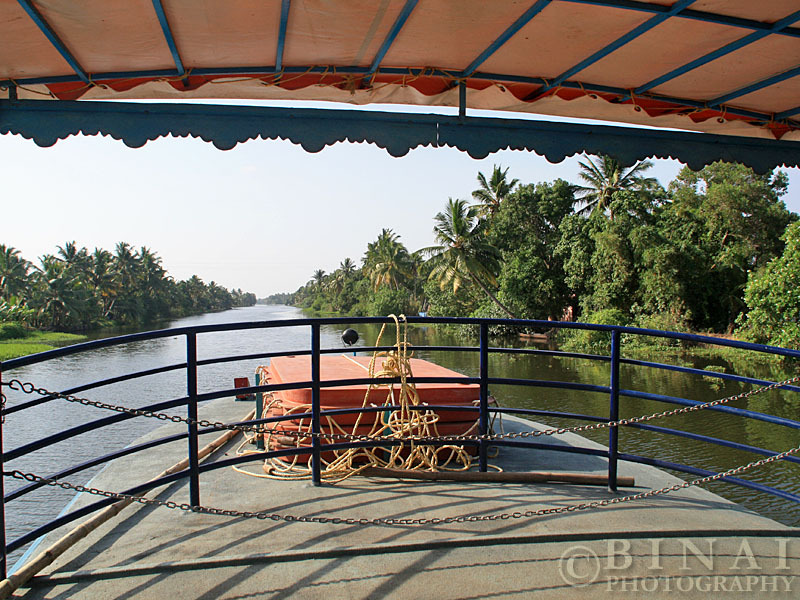 On getting into the boat, we went and talked to the crew – they were really friendly and most of them spoke very good English (our conversation was predominantly in Malayalam, though). The crew showed us the operating procedure of the boat and we had quite a long chat with them. The hierarchy of crew in boats is quite different – the conductor is called as “Boat Master”. The guy who handles the steering wheel is called a “Lascar”, while the guy who handles the engine is called a “driver”. 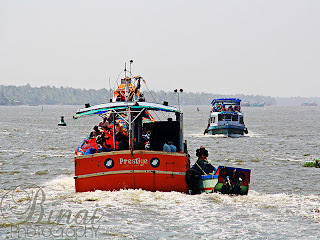 They said that the boat sees heavy crowd in the period following monsoon, when a lot of tourists come down. 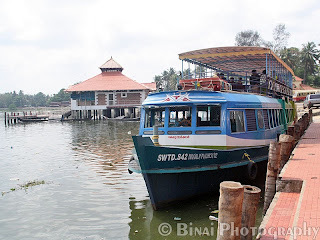 They said that its pairing boat (operated by SWTD Kollam unit) was a better one – it had pushback seats. 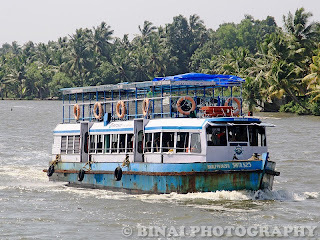 Alappuzha unit too had such a boat, but it had been sent for overhauling. The boat we got on that was a replacement boat. Shortly after the ride started.. The boat that would form our abode for the rest of the day had two decks. The upper deck had cushioned seats – it was open all around and gives an amazing view of the route. The lower deck had regular wooden seats – and it is actually designed to carry local passengers. 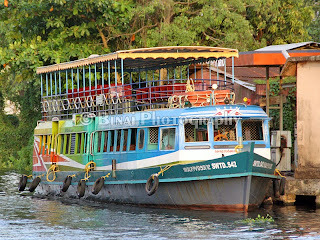 However, since the boat was running a tourist service, they wouldn’t be carrying local passengers and hence we could use either of the decks as we wish. The boat started off, perfectly on time - 1030hrs. There were some 20 passengers on board – most of them were to Vallikavu. Only a few of us were travelling until the end point. As the boat got moving, the conductor (called the “Boat Master”) came around to issue tickets to a few passengers and also take orders for lunch! The boat would stop for lunch at a resort on the way, and the food is prepared to order. He informed us that the lunch break would be around 1300hrs and took orders. The initial run was through a very wide lake. It was hot and very windy. There were a couple of normal SWTD boats around, which work local trips in the area. Passing under a road bridge.. Shortly after we entered a smaller canal. 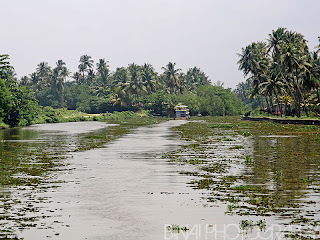 After sometime we exited the wide lake and entered into a much smaller canal. This canal was very shallow around the banks, and had sufficient clearance only in the middle. Speed was reduced and we were crawling very slowly. There was one more boat for company – that was a private boat, which came with tourists the previous night and now returning empty. This canal passes through Chavara, right behind the Titanium factory. Water was very brackish and looked very dark in colour. Some people where fishing along the banks (fishing in troubled waters, eh??). The crawl continued for quite some time. The ride was a bit monotonous in this section. Dredging was in progress in some stretches, and that meant more speed restrictions. After the monotonous crawl through the narrow stretch, we entered into another wide stretch. The ride was uneventful for quite a good portion of the journey. We finally berthed at the resort, around 1240hrs. 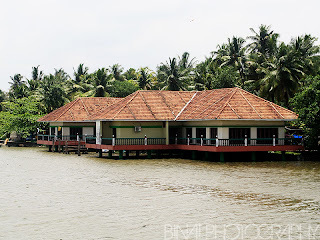 The place seemed quite deserted – I guess the resort catered only to tourists reaching there by the waterway. The food was served as a buffet – it was normal Kerala style food, with veg and non-veg options. The food was obviously quite pricey. We started off again at around 1315hrs. The place where we had lunch..
Post lunch, we decided to stay in the lower cabin itself. The crews were now relaxing, and we struck a conversation with them – they were amused on seeing us traveling in that route just to have an experience of it. They were very friendly and explained a lot of things. They said that the boat gets fairly good loads during season. They had very good opinion about the pairing boat – they said it was really comfortable. 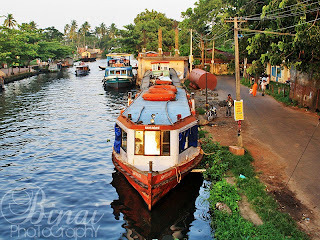 They consume close to 120lts of diesel for the trip – but the boat always gets a full tank when it starts from Alappuzha. The “driver” had nothing much to do – we were crusing at a fixed speed, and there was no slowing down anywhere. So all he had to do was to lock the throttle at the maximum position and relax – he just keeps monitoring the dials often. The “Lascar” too did not have much to do – we were cruising on a straight line. I remained in the cabin for some time – the guy showed me various landmarks. 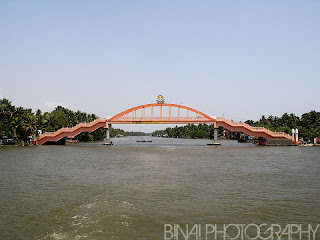 The Amrita Setu.. a bridge connected by the ashram to connect both the banks. Our next major halt was at Amritapuri (Vallikkavu) – the headquarters of Mata Amritanandamayi Math. We reached there at around 1340hrs – the boat almost emptied out here. Only a few of us were left for the remaining run. The halt was quick and we were back on the cruise soon. We next entered Kayamkulam kayal. This stretch of waterbody is quite long, deep and wide. Historically, this section is known for dacoities and accidents. Our track here was well marked – boundaries were marked by Chinese fishing nets. There was heavy crosswind and the lascar had a tough time keeping the boat on track. I was back in the cabin for some more time. After sometime, we got hold of three seaters and relaxed for some – had a short nap as well. We crossed out pairing boat at around 1433hrs – that boat was the regular “luxury boat”. It was quite full as well. The windy ride through the kayal took about an hour and 15 minutes. Thats the pairing boat seen closer.. There was a small regulator kind of thing at the exit of the kayal. 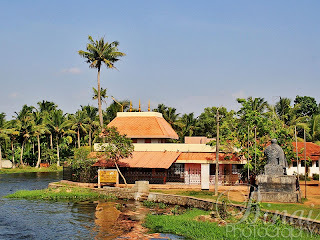 (Kayal = lake/backwaters). Once we passed that, the ride got peaceful – no more crosswinds. The water became clearer – the water was brackish till then. We were now in freshwater – the boat got silent as well. 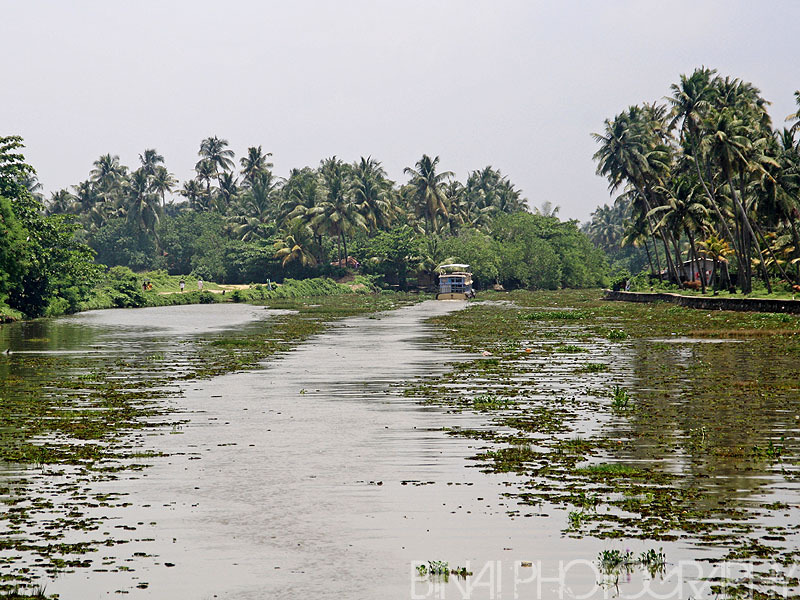 We were in typical kuttanad areas now – a narrow canal kind of route lined with trees on both side. We passed a couple of famous places as well – like the Mahakavi Kumaranasan Memorial. We stopped for a tea break at around 1555hrs – at Thottappally. It was roadside (er! Canalside) tea shop. The road was at a walkable distance from here. A family got off the boat and headed to the road to get a bus to continue to Alappuzha – now around 5 of us remained in the boat. The shop served hot tea with some lip-smacking snacks. We started off at 1608hrs. 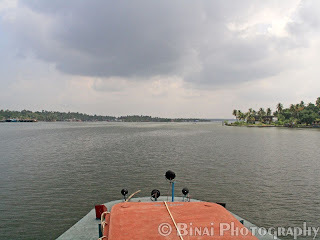 We were on National Waterway-3 till we entered Thottappally lake. Now we deviated from the National waterway and entered a small canal that goes through Karumadi. 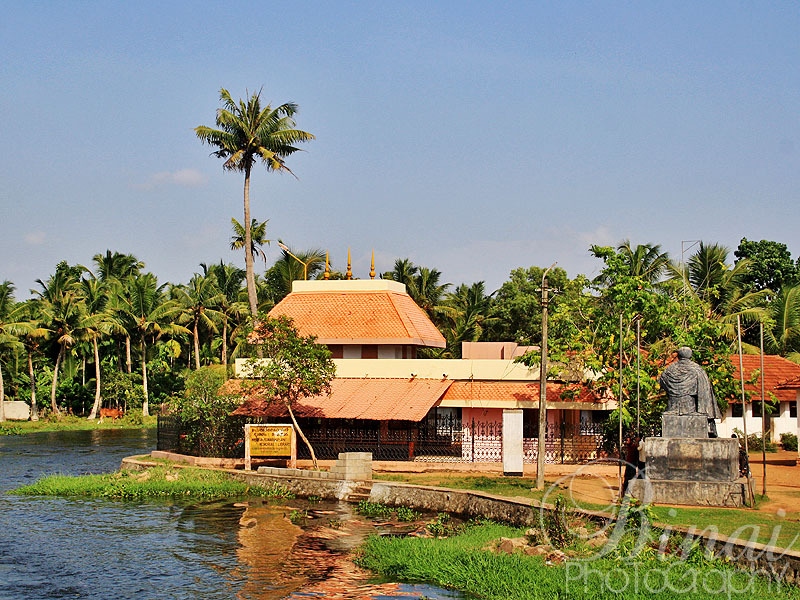 Karumadi is a famous place in Alappuzha district that features a 11th century statue of Lord Buddha. The statue is visible from the canal. Wading through the narrow canal.. The canal was quite narrow and hence we cruised through very slowly. We were back in National Waterway soon after crossing Karumadi. 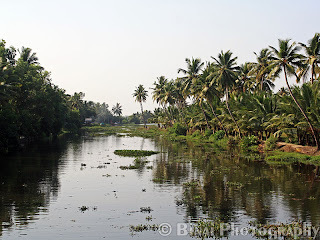 We were now in the heart of Kuttanad. It was a quite nostalgic ride now – I was passing very close to my mom’s hometown. The ride got eventless now – we were just cruising through a very relaxed route. 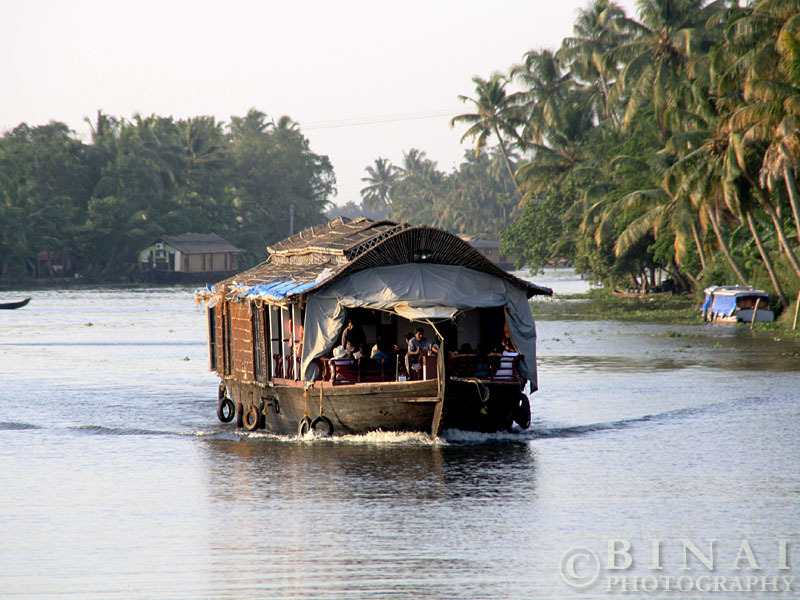 Lots of houseboats gave us company – some of them were preparing for their night halt, while others were rushing back to their base in Alappuzha. 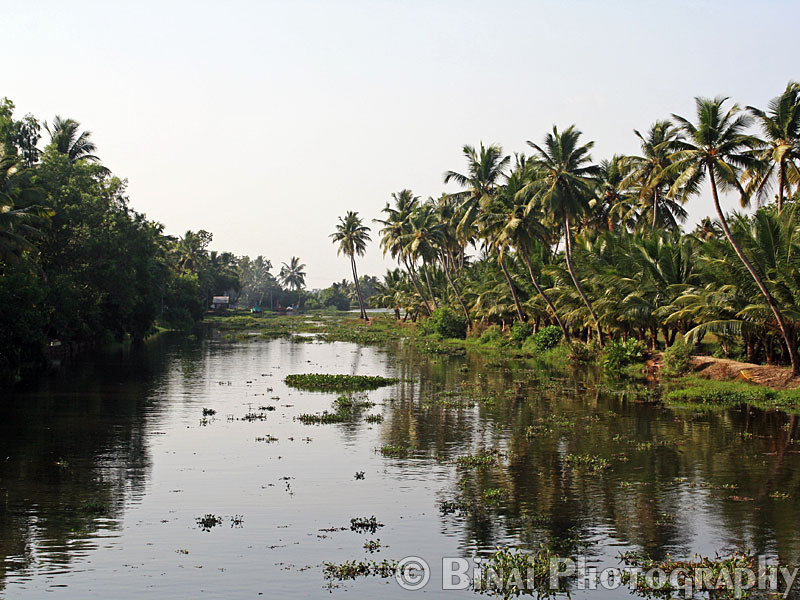 After some more time on NW3, we turned off to a small canal, and then to the famous Punnamada lake. By now the crews were preparing to sign off their duty. We passed by the dock of SWTD and finally terminated the journey at the fuel station of SWTD, right outside the KSRTC bus station – at 1808hrs. 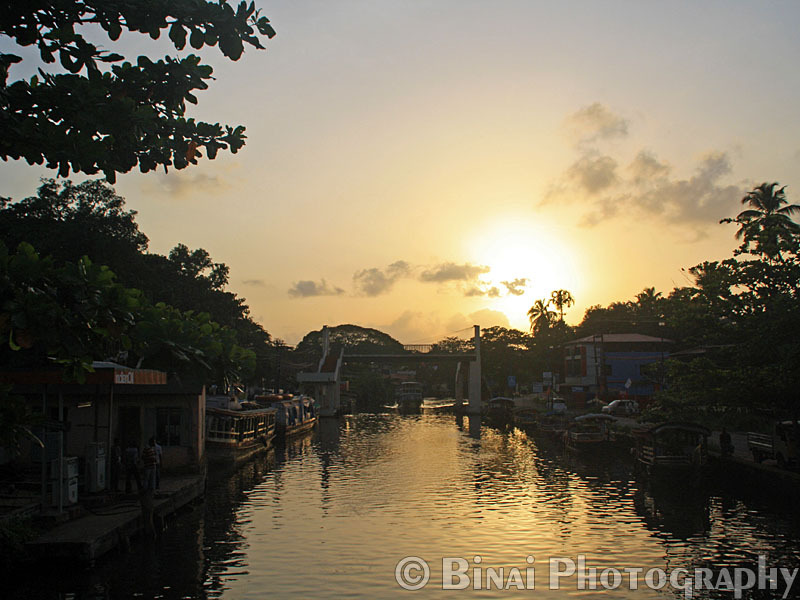 A good 7:38hrs after we started from Kollam. We covered a distance of 77 hrs in the run – an average speed of about 10kmph! The road distance is about 82kms – about 2.5hours by bus! 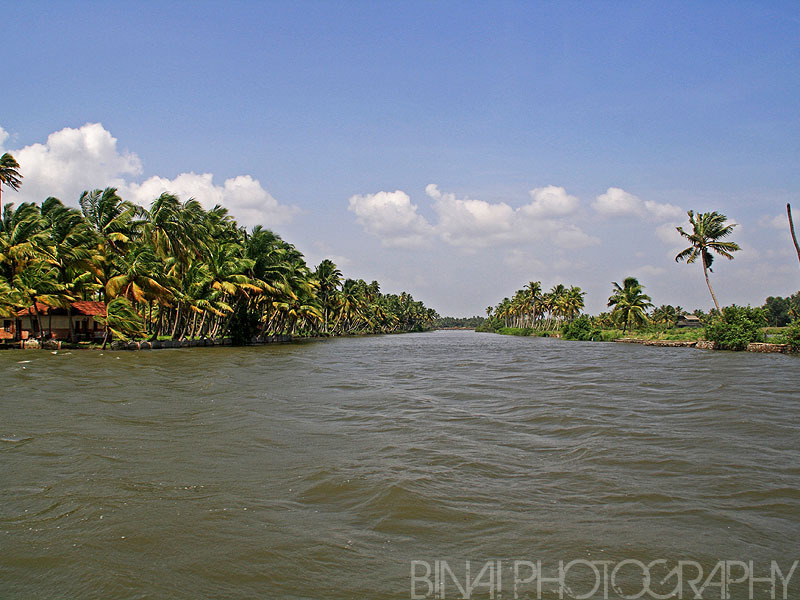 Entering the destination.. this is Alappuzha canal. This journey is not intended for the normal passenger – it’s for the leisurely rider. 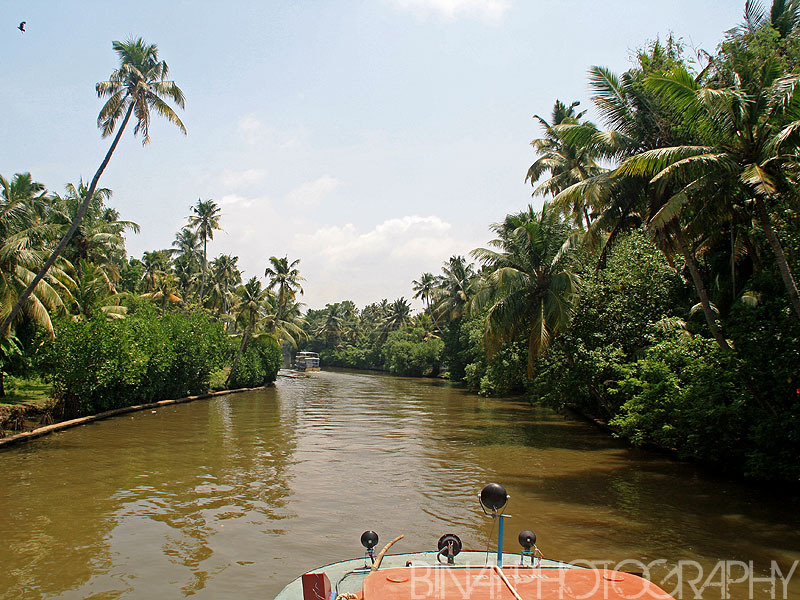 A wonderful ride through the backwaters for over 7 hours at a small price! Waterways are the best option for freight transport – it is shorter compared to the roadway, and its environment friendly as well. Being a consumer state, Kerala should do its maximum to minimize road traffic. I loved every moment of the ride. I am not sure if I’d ever repeat it in my life – but I’d recommend it for anybody looking for a leisurely backwater ride. If you've reached here - thanks a lot for reading, and a lot of apologies for the delay in writing this piece. There are more photos - they are not yet edited. I hope to finish editing them and upload them sometime soon. On Shama B9R, to Thrissur..